LIHUE – The Hawaii Department of Transportation (HDOT) advises Kauai motorists of 24/7 lane and intersection closures in the vicinity of Lihue starting on Monday, Sept. 28. These closures will occur for road paving as part of the Nawiliwili Road Improvements project. See below for lane closure details. 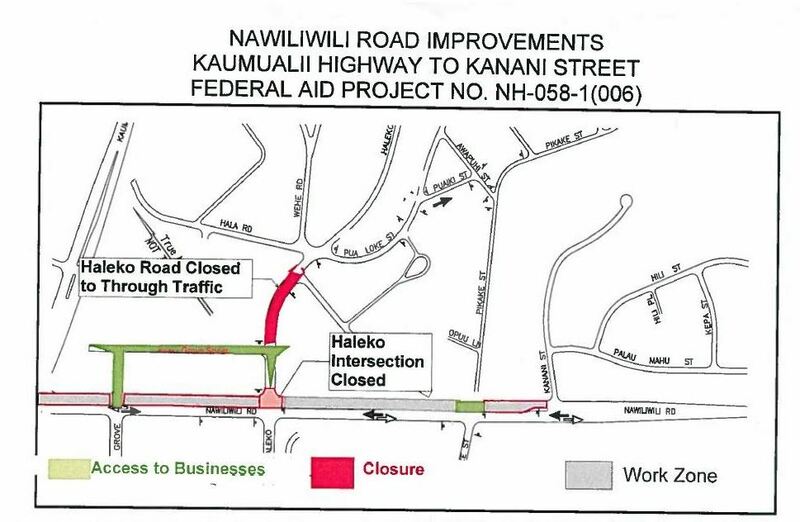 · Single lane closure on Nawiliwili Road in both directions between Kaumualii Highway and Kanani Street. · All lanes of Haleko Road closed in both directions between Nawiliwili Road and Kukui Grove Street. · Nawiliwili Road and Haleko Road Intersection closed in all directions. In addition, the Department of Water will be performing waterline work that will require all lanes to be closed on Haleko Road in both directions between Kukui Grove Street and Pua Loke Street. This 24/7 closure will occur in conjunction with the closures for the Nawiliwili Road Improvements project and both will last approximately three weeks. Access to Kukui Grove Shopping Center will be available from Kukui Grove Street and Haleko Road on the west side of Nawiliwili Road. Motorists are advised to proceed with caution through the work area, allow extra time to get to their destinations, and use alternate routes.